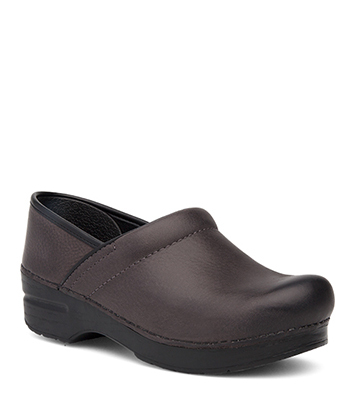 The Dansko Grey Burnished Nubuck from the Professional collection. Rub gently with a nubuck bar and brush to remove surface stains. For maximum water and stain protection, we recommend periodically applying a nubuck spray. Firm foot and arch support. Contoured midsole keeps your foot supported and secure. Superior shock absorption. Comparable to athletic footwear. Anti-fatigue rocker bottom. Keeps you going all day long. Roomy toe box. Allows toes to move comfortable. For leather clogs, socklining is anti-microbial, leather. For non-leather clogs, lining is synthetic microfiber. Heel height is 2 inches. The Stapled Clog carries the Seal of Acceptance from the APMA (American Podiatric Medical Association). The APMA Seal of Acceptance is awarded to shoes that promote good foot health and is independent proof that Dansko shoes are made with your comfort and long-term wellbeing in mind.